Shop small and shop downtown with the Davis Downtown 30 on 30 Shopping Promotion. Davis Downtown is bringing back its popular 30 on 30 shopping promotion and we would like you to participate. Each month, we will promote downtown, encourage shoppers to visit downtown on the 30th of the month, and to spend at least $30 supporting our downtown businesses. Our downtown has a lot to offer and we want to remind the community to think of downtown first and support our local businesses. All you have to do is come up with some exciting promotions/discounts that are only available for that day, the 30th of each month. 30% off select store items. 30% off kids meals with the purchase of any regular meal. We will take care of promoting your business the following ways. Promotional materials for downtown businesses. Davis Downtown Gift Card giveaways. As part of the program and to encourage people to shop downtown, Davis Downtown will holding a drawing and giving away $30 Davis Downtown Gift Cards. For each month, shoppers will get one entry for every $30 spent at downtown businesses. The more they purchase, the more chances they have to win. Hopefully, your business accepts the Davis Downtown Gift Card so the winners will visit your business again. Close to $80,000 in Davis Downtown Gift Cards are purchased each year. The 30 on 30 promotion will begin on April 30, 2018 and will occur on the 30th of each month for the balance of 2018. We will need confirmation of your participation and your promotional information by April 16, 2018 and by the 16th of each month thereafter. Don’t worry, we will send you a reminder as the deadline approaches. Davis Downtown hosts this popular community tradition every year on Halloween. Local businesses open their doors and welcome the community for a safe fun and colorful Halloween and Dia de los Muertos. The event always occurs RAIN or SHINE! We provide businesses with the Orange Treat Trail signs in advance of Halloween. The Annual Treat Trail includes complimentary screenings of It’s The Great Pumpkin Charlie Brown at the Varsity Theater. Showings are on Oct. 31. FREE! The Day of the Dead Festival brings E Street Plaza alive with color, dance, music, and stories on October 31 from 2pm to Sunset. Dia de los Muertos is a traditional Mexican-American holiday dedicated to the ancestors; it honors both death and the cycle of life. In Mexico, neighbors gather in local cemeteries to share food, music, and fun with their extended community, both living and departed. The celebration acknowledges that we still have a relationship with our ancestors and loved ones that have passed away. We encourage all people of all ages to come dressed in traditional El Dia de los Muertos dress and costumes. Sponsorship opportunities are available for the Treat Trail and Dia de los Muertos. 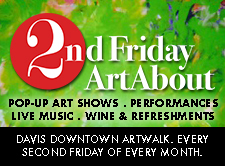 Originally developed for the Saturday immediately after Thanksgiving, Davis Downtown is expanding this program to every Saturday between Thanksgiving and Christmas. Shop Small® is a holiday shopping tradition that celebrates small businesses and encourages customers to patronize their local small businesses. We are including a Davis Downtown Gift Card Giveaway as part of Shop Small® for the Holidays. Each weekend customers can qualify for the gift card drawing. To help promote shopping and for customers to spend more time downtown, we offer shoppers free parking on the Saturdays between Thanksgiving and Christmas. Sponsorship opportunities for Shop Small® for the Holidays will be available.